On the morning of April 29, 1986, librarian Dan Dupill was answering telephone calls at the Literature Reference Desk at Central Library. The antiquated phone system was slow, and the volume of calls high in those pre-Internet days, so getting through to a Reference Librarian could be a challenge. When the emergency alert started going off, Dan figured it was another false alarm that had become commonplace at the 1926 building. Rather than hanging up on the patron, who had already navigated the phone system once, Dan offered to put them on hold, figuring he would be back in ten minutes. It would be seven years before he answered another phone call at Central Library. He has often wondered just how long the caller stayed on hold before realizing that the building was actually on fire. Damaged books waiting to be packed up and treated. 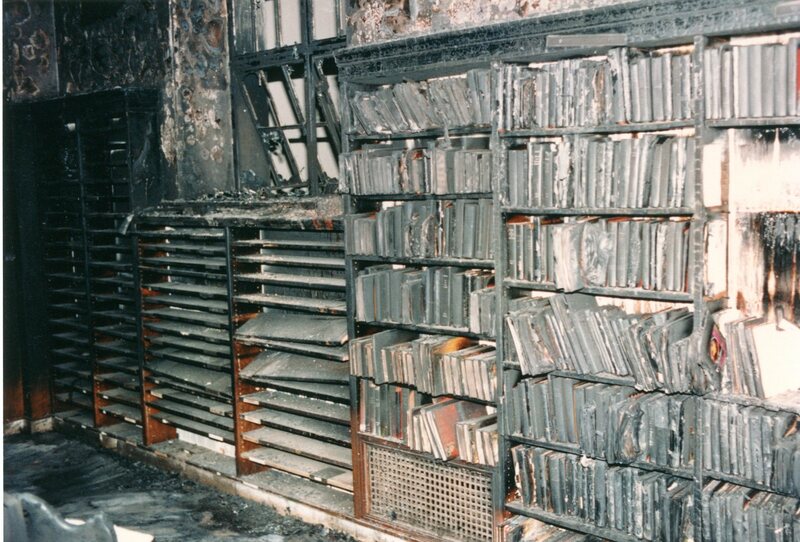 I started working at Central Library 20 years after two fires devastated the building and collections in 1986, yet "The Fire," as these events are commonly referred to around here, is a constant presence, even as we approach the 30th anniversary of that dark day. The collections still bear the scars of 1986, with books and periodicals revealing their history through visible smoke and water damage, or by the unmistakable scent of fumes absorbed three decades ago. Phantom citations reside in the California Index, which point researchers to materials lost in the "The Fire," and I still contend with the damage done to the Valley Times image archive where on two separate occasions condensation formed in the drawers where the photos were stored. These tangible reminders of Central Library's fateful past are only one facet of "The Fire's" legacy, and while it may be easy to focus on these visible and devastating impacts, there are other legacies of the 1986 events that will be longer lasting. 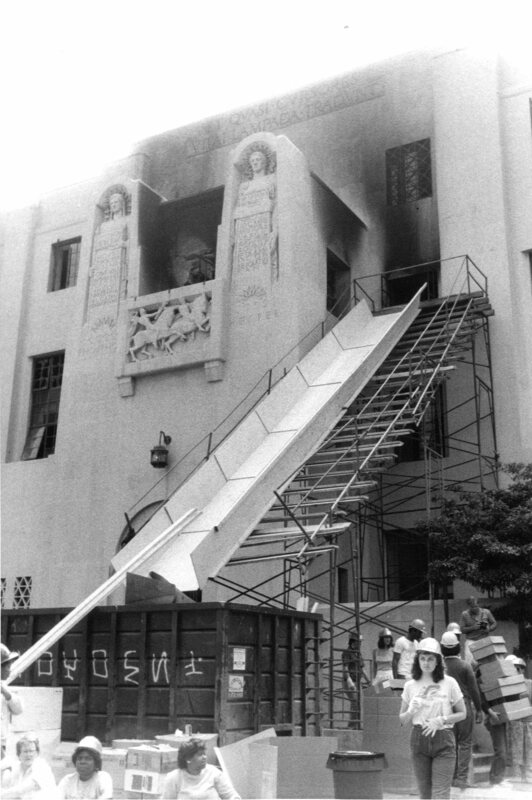 As terrible as the 1986 fire at Central Library was, it shone a spotlight on how much the residents of Los Angeles value their libraries. "The Fire" has gone down in the annals of the Los Angeles Fire Department as one of the hardest to contain, yet the firefighters worked tirelessly for hours because they knew what was at stake. In the days that followed, 1,700 volunteers from all walks of life, pitched in to help box up materials to be treated for damage or just stored offsite. The Los Angeles Public Library has always served its community, but much like the passage of Measure L during the recent financial downturn, "The Fire" demonstrated that when the Library needs the community, they will rally in support. I have encountered so many people who vividly remember that day in April, and who walked away from it with an appreciation of public libraries they will never take for granted. For the staff, who worked around the clock in the immediate aftermath, "The Fire" also meant being displaced from their home away from home and coming to terms with a loss of collections. Yet, living through the experience, working together, and emerging victorious seven years later created a bond between these staff members that is unique and continues to drive many of them to devote so much of themselves to the Los Angeles Public Library. I have heard many firsthand accounts of that time, some humorous, like the one of putting the phone patron on hold, and others tinged with great sadness. As much of a connection as I have with the vast and deep collections here at Central, I am frequently taken with how strong the bond is between staff members and Central Library that was forged during this period. This is something impossible to comprehend if one didn’t live through the events as a library employee. Central Library reopened 23 years ago, so it’s easy to be far removed from its past. While a renovation of the building had been in the works prior to "The Fire," and would have probably moved forward, the end result would have been vastly different. From these events came a new sense of purpose for Central Library as well as the Los Angeles Public Library system as a whole. 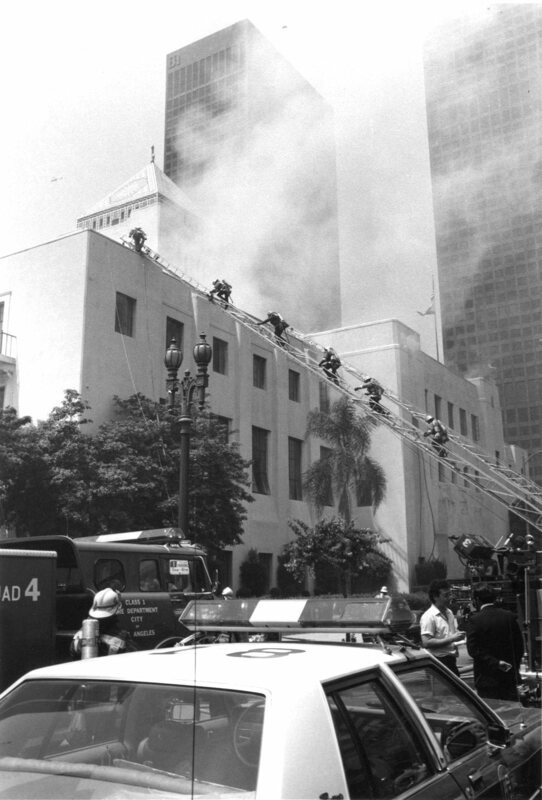 "The Fire" also lead to the formation of the Library Foundation, which has played such a large role in programming and fundraising, as well as the Los Angeles Preservation Network (LAPNet) which seeks to meet the preservation needs of librarians, archivists, conservators and records managers working in Los Angeles city and county. "The Fire" at Central Library was horrific event that shouldn’t necessarily be celebrated but at the same time should never be forgotten. What can be acknowledged are the actions of thousands of people who rallied around a library to ensure that it would remain for generations to come. That is a legacy worth commemorating.